Only seed depth and disc settings have to be performed manually outside from the tractor cab. Depth adjustment is made by turning the screw by hand or with a ratchet. 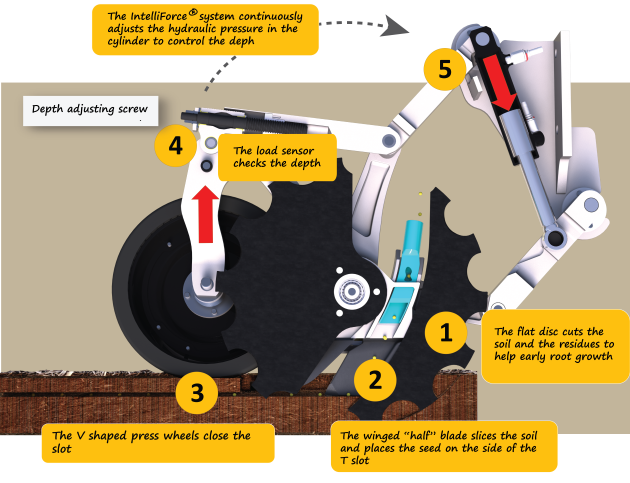 Every half turn, the user can precisely adjust the height between the press wheels and the blade + disc assembly, therefore optimizing seeding depth. Seeding depth can be adjusted individually on each opener. This enables new possibilities like seeding at different depth on different openers. Drilling combination like big seed / small seed, drilling 1 row out 2, 1 row out of 3 can thus be made easily. Every opener is mounted with its own hydraulic cylinder, and can apply up to 500kg downforce to the soil. The residual force under the press wheel essentially depends on drilling conditions, residue cover and soil structure. In Manual, the user directly adjusts the pressure, using the NOVAG joystick installed in the cab, or the monitor. This way, the hydraulics and the opener cylinders are set at a constant pressure. Blades of different length can be mounted on a single opener. This setting creates many possibilities in terms of fertilizer banding, associated crops, or cover crops. The disc can be mounted at 3 different positions (holes), at different height. This setting is often used to compensate disc wear and improve its motricity. The Novag opener is a simple, yet clever design. Their heavy construction allow them to penetrate the hardest soils, even with stones. They create inverted T slots .